I’m so excited to be sharing one of my new favorite tops I recently picked up from Nordstrom. It’s so versatile and can easily be dressed up or down. And the best part? It’s just under $50! 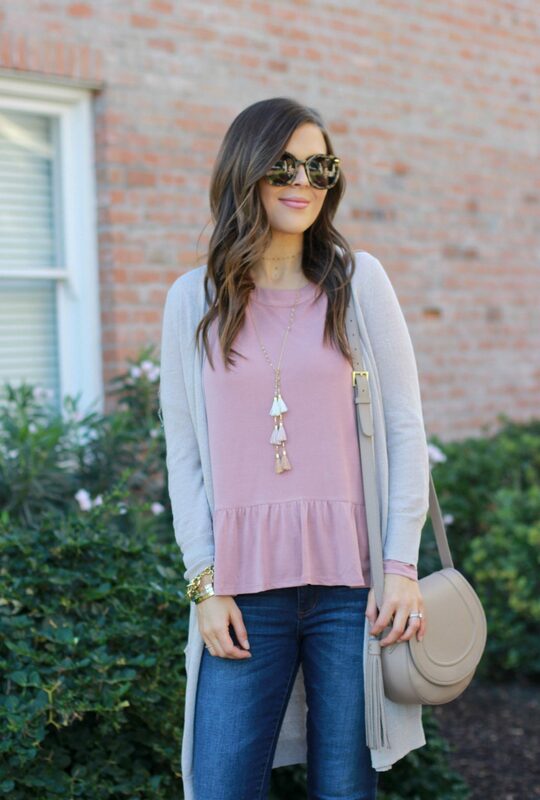 I love the ruffle hem and the deep blush/mauve color that’s so in for fall right now. It also comes in two other colors including a gorgeous burgundy. I decided to style the top more casually as something to wear for Thanksgiving dinner. We don’t usually get too dressed up in my family because let’s be real, who doesn’t want to be comfy when they’re eating lots of delicious food and watching football? I paired it with my most worn and loved cardigan and these taupe booties which are currently 20% off. For an evening look, I wore this ruffle hem top for a date night out with Colton. Being new parents, it’s pretty rare to get a night out together so when we do I really like to make the effort to get dressed up. I accessorized with a pretty pair of statement earrings and my leopard clutch. I topped it with a denim jacket and wore a pair of black heels to make the look a little dressier. 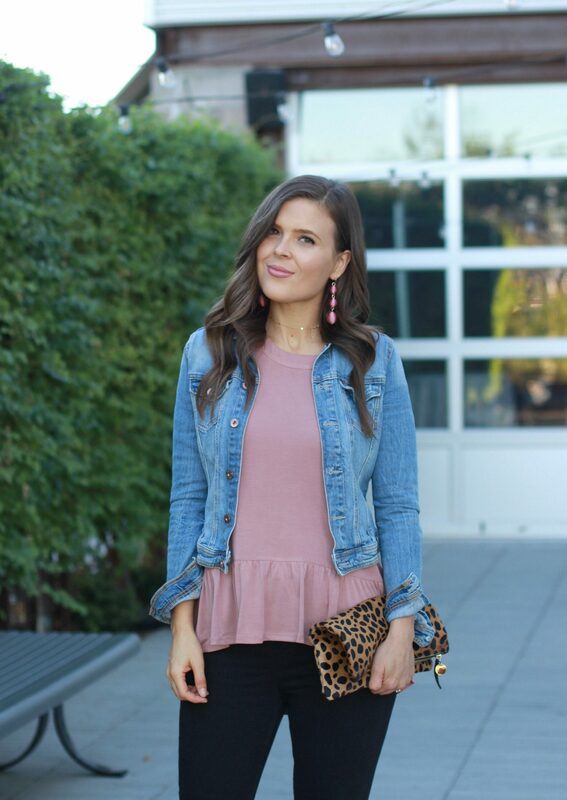 I hope you love this ruffle top as much as I do and that my two looks gave you some fall outfit inspiration. As a reminder, Nordstrom always has free shipping and free returns so you can shop online from the convenience of your home. I just love versatile blouses like the one you’re wearing. The ruffled bottom adds a nice touch! Need this top in my closet ASAP! I think I especially love the second outfit on you! The color of that top is gorgeous and paired with the black pants, jacket, and heels it’s just extra fun and works for so many occasions! Girl I would live in this ruffled top! Looks so cute and comfortable. This ruffle top you have on is too darling! I love how you styled it with your demin jacket. Such a classic look! This is such a pretty top and I love how you styled it with the black jeans and heels – the perfect date night look! 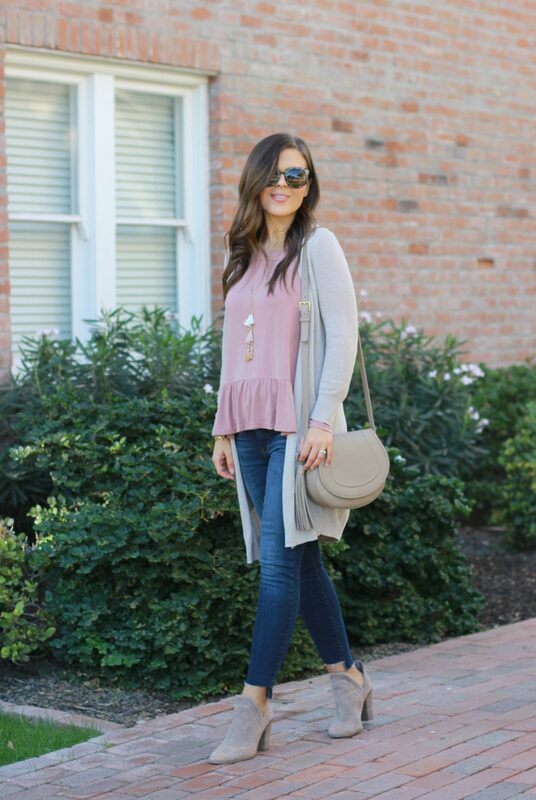 I love this top and both ways you styled it! Loved the way you styled this top! That color is gorgeous! Love that your top is simple but cute at the same time.